Children can share what they’re thankful for with this easy craft, which is great for preschool or day care, or as a kids’ table activity on Thanksgiving Day with the family. What You Need: Large brown construction paper circle; small purple construction paper circle; small purple construction paper rectangle; four or five colorful feather shapes. (You can precut all of these or trace them and have the kids do it. ); scrap of orange construction paper; 2 googly eyes; black pipe cleaners; scissors; glue. How to Make It: Ask child to dictate several things he or she is thankful for. 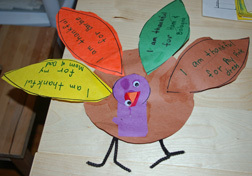 Write them on the pointy oval “feathers.” Child can then assemble the turkey as shown. Bending lengths of pipe cleaner outward makes the feet.